This card often appears rather sickly to look at and the colouring and shapes on the card depict a sense of something overdone and having a lack of energy. Looking to the correspondences of the card we see that astrologically this is Venus in Scorpio. We have the passionate, sometimes obsessive energies of Scorpio acting upon Venus the planet of emotionality, love, beauty and art. So we see here a card talking of passionate connection with others, possibly outside the usual expected realms of love and beauty given Scorpios delight in the taboo. So we both have lack of inhibitions and a freedom to follow ones own personal expression of passion in whatever form it takes, and the darker side of obsession and addiction in all forms. On the mundane level it can speak of late nights, partying and general hedonism. This might be seen as a positive thing – a release from the discipline and restrictions usually in our lives or, if taken too far, a more debilitating exhausting and self destructive thing where we are wearing ourselves out through lack of good sleep, food, rest and time to recover from one social engagement to another. We see Venus is in detriment in Scorpio so the tendency is to overdo things to such an extent we may not take the opportunity to pull ourselves back into balance. However knowing this when this card comes up in a spread it can alert us to the need to bring things back into balance and help us gain the strength to do so – surrounding cards can show how successful any attempt to do this is likely to be. In relationships we are also prone to be feeling as if we are drawn, almost against our will, into relationships with people who don’t fully suit us, address our needs or who have little to give back. This card shows us it time to start to consider where we need to pull those boundaries back into place and how we are going to say no to once pleasurable things. If we can retreat into ourselves, we also can give ourselves both emotional and physical nourishment. 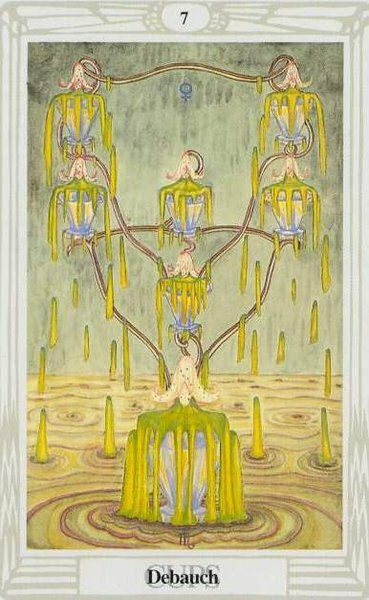 Over-work in the career department can also be foretold with this card and if the 8 cups follows then a certain warning that time out is needed, a rest, a holiday, or some strong boundaried action about what you can and can’t offer in the workplace. Looking at the Kabbalistic connections here we have 7 at the position of Netzach in the world of Briah (cups) which is the natural place of Venus and also of the energy of victory over our emotions. So there is hope with this card that we can turn things around at this point and that our emotions do not have to rule us in a negative way, though as see above Venus though happy Kabbalistically, astrologically Venus is struggling with the single-mindedness of Scorpio; the place of detriment makes this victory something of a struggle – though, if truly achieved, worth it. We can turn our obsessions into strong healthy passions if we balance them by expression, acknowledgement, and understanding. Allowing our self to hear ourselves fully, repressing nothing, we free ourselves from the addictive potential of our drives. We gain victory over what could be destructive forces in ourselves – this leads us to a greater mastery on this plane. Be aware of the tendency in this card of deluding ourselves about how far we have actually managed to achieve this, we can feel as if we have conquered our addiction or pattern, but actually we still need a good deal of alertness to the possibility it is an illusion and there is more work to be done.